Although many different flaps described in the reconstruction of fingertip amputations, these techniques may not provide optimal esthetic appearance due to hyponychial tissue loss and the lack of volar support of the nail bed. In this study, we aimed to investigate the utility of the reverse dorsal facial flap, which we used in injuries at the level of distal phalanx, and to determine satisfaction rate of the esthetic and functional results obtained. Patients who were referred to our clinic due to fingertip amputation including total loss of nail bed between 2014 and 2017 and who could not be replanted were prospectively included in this study. Patients with a poor clinic condition, smokers, those with proximal injuries of the fingertips, aged over 60 years, and patients who have not follow-up period were excluded from the study. Written and oral consent was obtained from all patients. All surgical procedures were performed by a single surgeon. Assessment was made according to the Visual Analog Scale (VAS) and Disabilities of Arm, Shoulder, Hand (DASH) scoring. The Likert scale was used to evaluate esthetic outcomes of the patients [Table 1]. In this scale, general appearance, shape, color, and texture were evaluated. Each question was numbered from 1 to 5, with the best being 5 and the worst being 1. Three different surgeons who were blinded to about the patients evaluated the results. The total average score was calculated. The satisfaction scores of the three surgeons were averaged. Sixteen patients (12 males and 4 females) were included in the study. The mean age of the patients was 28.9 (range: 16–45) years. The level of injuries was Tamai Zone 1 in all patients. 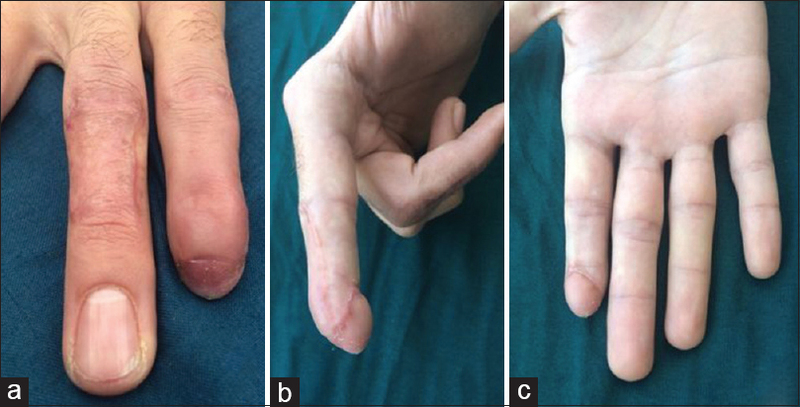 Ten patients had dorsal amputation and nail bed defects. The whole pulp was intact in ten patients. In two patients, replantation was performed after avulsion-type amputation at distal phalanx level. Then, a cross-finger flap was applied on the exposed bone after debridement for volar skin defect because of circulation loss. A reverse facial flap was applied on the dorsal side. Replantation was not suitable in four of the amputees. Four patients had volar skin defects, V-Y flaps were applied in three patients and cross-finger flap in one patient, and a reverse facial flap was applied on the dorsal side. In one patient who had bone and nail bed defects with intact volar skin, a reverse fascial flap was performed after reconstruction of phalanx with a bone graft which was obtained from the olecranon. In one patient who had intact skin continuity and bone and nail defects, reverse fascial flap was performed after reconstruction with bone graft which is obtained from the olecranon. Defect measurements were made under digital or regional anesthesia and tourniquet, together with recipient site preparation. Flap planning was made from the proximal part of the nail bed toward the middle phalanx depending on the defect size. The skin was harvested superficially to the lateral side and kept on the fascial layer at the bottom. Then, a fascial flap was harvested by preserving the paratenon [Figure 1]. The flap was transposed, and the reconstructed area of the nail bed or defect of the nail bed was closed. A full-thickness skin graft, which was taken from the inner face of the arm and the wrist, was applied over the fascia. The donor area was closed primarily. Patients with an open wound on the palmar region with dorsal defect were administered cross-finger flap [Figure 2]. These flaps were separated under local anesthesia after 21 days. To prevent venous congestion, it has been suggested to keep the patient's hands elevated. After surgery, grafts were opened on the 4th day and daily dressing was done. The average follow-up duration was 19 (range: 13–21) months. There was no total flap loss or partial necrosis in any patient. None of the patients had complications that would require a second flap surgery. There was no donor-site complication or bone union problem. The mean VAS score of the patients' at 12th month was 1.06 (range: 0–3). The calculated DASH was 3.08 (range: 2.1–5.4). The mean Likert score of the patients was 17 [Figure 3]. In spite of several defined flaps for soft-tissue reconstruction in fingertip amputations, there is no commonly applied technique for nail reconstruction except surgeries with nail bed obtained from the amputated part and nail bed grafts provided from other fingers. The results of both techniques are variable due to the patient factor. Finger shortness can be seen following nail bed grafting operations in fingertip amputations. In order to avoid shortness, nail reconstruction with adding a bone graft to fingertip has been recommended in amputations proximal to lunula. Another surgical method for nail reconstruction is skin nail transfer. Frequently, digital artery-based skin nail free flap provided from the great toe can be used in reconstruction. It was claimed that this technique gives an excellent result both esthetically and functionally compared to other approaches, but proposition about the application of this procedure on selected patients was also mentioned. The requirement of microsurgical equipment, long operational time, and sacrifice of a digital artery are the main disadvantages of this procedure. The use of subcutaneous vein as a pedicle instead of digital artery was also pointed out in another study. The nail bed and nail matrix are transferred as a free flap in this surgical method. Considering the physiological circulation of flap, the survival mechanism of artery-based venous nail bed remains unknown. Arterialized venous toe nail flap tends to be ischemic because of the large impact of the shunt and venous valves on flap circulation. The necessity of microsurgery and acquired donor-area morbidity as in nail bed grafting method restrict the application of this procedure. It was suggested that normal nail growth can be achieved by serial excision and elongation in patients who had partially scarred the nail bed. This technique was not suitable for our patients because patients who had fingertip amputation including total loss of nail bed were included in our study. As pointed below, although our technique is not a nail reconstruction technique, full-thickness skin graft placed to the dorsal part of finger without nail reconstruction provides a nail-like appearance, inducing hyperpigmentation in late period after surgery. Previously, performing dorsal fascial flap together with skin graft was suggested in literature; however, obtaining a nail-like appearance with hyperpigmentation after the full-thickness skin graft placement and performing dorsal fascial flap together with skin graft to mimic nail appearance have not yet been reported. Although appearance of full-thickness graft is not like a nail graft, the mean Likert score which represents the esthetic evaluation of flaps was 17 in our study and it can be accepted as a satisfactory score. The mostly applied surgical methods in tip reconstruction are Atasoy and Kutler V-Y flaps. The mobility of Atasoy flap is exceedingly sliding in contrast to Kutler flap. Including only the palmar surface of finger and providing adaptation in limited defect sizes are the main disadvantages of both techniques. Therefore, bilateral V-Y flap application was recommended by the authors. Digital artery perforator flap is a significantly important alternative method for tip reconstruction due to the reliable circulation and possibility of involving a digital nerve in case of need. Although adipofascial turnover flaps have been described for dorsal finger defects including fingertips, the nail reconstruction was not been supplied in any of the flaps pointed out. Laoulakos et al. reported that adipofascial turnover flap can be recommended in tip defects. Then, Hoşnuter et al. performed this flap for tip reconstruction in patients with intact nail matrix, but reconstruction was performed for tip closure rather than nail reconstruction as an esthetic unit in both studies. Rampazzo et al. performed this flap in a patient, but the pedicle was cut both proximally and at the nail bed after 3 weeks. It was claimed that skin grafting of the exposed pedicle is not needed because of rapid, spontaneous re-epithelialization. Our study differs from the above-mentioned three studies because the reconstructed nail as a total esthetic unit instead of partial reconstruction gave better esthetic result. Although it was claimed that the chance of the patient having a nail must be preserved as much as possible, in our study, all of the patients had nail and nail matrix loss and this flap was performed to mimic nail appearance. Whereas in the present study, we found that reverse dorsal fascial flap with skin graft can be performed to mimic nail appearance. Besides the advantages of fingertip flaps, the dorsal fascial flap also provides a nail-like appearance after a while following the operation. Most of the flaps defined for fingertip amputation do not compensate the requirement for shortening of a digit. This issue is also among the benefits of our technique. Though all of the patients included in the study had exposed bones preoperatively, there was no need for any secondary flap operation and wounds remained to secondary healing. In contrast to flaps applied in fingertip reconstruction, the use of dorsal fascia provides preservation of the palmar surface, which is significantly important in sensory features of fingers. Furthermore, the dorsal fascial flap is more appropriate for dorsal oblique fingertip amputation defects due to flap source compared to other fingertip reconstruction flaps, while limited utility can be encountered in palmar defects of fingertip. In our study, it was proposed that issues such as short operational time, steep learning curve for practice, nonmicrosurgical execution without shortening the exposed bone, and esthetically favorable appearance are the leading benefits of this flap. However, the skin graft requirement and a need of secondary operation in patients undergoing cross-finger flap together should be mentioned as the main disadvantages of this technique. The dorsal fascial flap can be applied as an alternative surgical method in patients with fingertip defects including nail loss or damage in order to provide an esthetically favorable nail appearance. Dadaci M, Ince B, Altuntas Z, Bitik O, Kamburoglu HO, Uzun H, et al. Assessment of survival rates compared according to the Tamai and Yamano classifications in fingertip replantations. Indian J Orthop 2016;50:384-9. Lemmon JA, Janis JE, Rohrich RJ. Soft-tissue injuries of the fingertip: Methods of evaluation and treatment. An algorithmic approach. Plast Reconstr Surg 2008;122:105e-117e. Butler DP, Murugesan L, Ruston J, Woollard AC, Jemec B. The outcomes of digital tip amputation replacement as a composite graft in a paediatric population. J Hand Surg Eur Vol 2016;41:164-70. Dadaci M, Ince B, Altuntas Z, Bitik O, Uzun H, Bilgen F, et al. A novel technique for distal fingertip replantation: Polypropylene suture guided interpositional vein graft. J Plast Surg Hand Surg 2015;49:1-4. Malshikare VA. New technique “graft reposition on flap” in Allen type iv amputation: A report of six cases. Hand Surg 2015;20:173-9. Ishii N, Shimizu Y, Aoki M, Suzuki A, Kishi K. Analysis of the survival of arterialized venous toenail flap with reference to changes in blood circulation during the postoperative period in 2 patients. Plast Reconstr Surg Glob Open 2016;4:e1078. Raja Sabapathy S, Venkatramani H, Bharathi R, Jayachandran S. Reconstruction of finger tip amputations with advancement flap and free nail bed graft. J Hand Surg Br 2002;27:134-8. Yan H, Persons B, Gao W, Angel MF, Zhang F. Nail flaps for microsurgical aesthetic reconstruction of thumb and donor site of great toe. J Plast Surg Hand Surg 2012;46:212-4. Peng F, Liu YX, Wan ZY. Percutaneous pinning versus volar locking plate internal fixation for unstable distal radius fractures: A meta-analysis. J Hand Surg Eur Vol 2018;43:158-67. Parrett BM, Bou-Merhi JS, Buntic RF, Safa B, Buncke GM, Brooks D, et al. Refining outcomes in dorsal hand coverage: Consideration of aesthetics and donor-site morbidity. Plast Reconstr Surg 2010;126:1630-8. Lemperle G, Schwarz M, Lemperle SM. Nail regeneration by elongation of the partially destroyed nail bed. Plast Reconstr Surg 2003;111:167-72. Brunelli F, Vigasio A, Valenti P, Brunelli GR. Arterial anatomy and clinical application of the dorsoulnar flap of the thumb. J Hand Surg Am 1999;24:803-11. Özcanlı H, Bektaş G, Cavit A, Duymaz A, Coşkunfırat OK. Reconstruction of fingertip defects with digital artery perforator flap. Acta Orthop Traumatol Turc 2015;49:18-22. Laoulakos DH, Tsetsonis CH, Michail AA, Kaxira OS, Papatheodorakis PH. The dorsal reverse adipofascial flap for fingertip reconstruction. Plast Reconstr Surg 2003;112:121-5. Hoşnuter M, Kargi E, Işikdemr A. 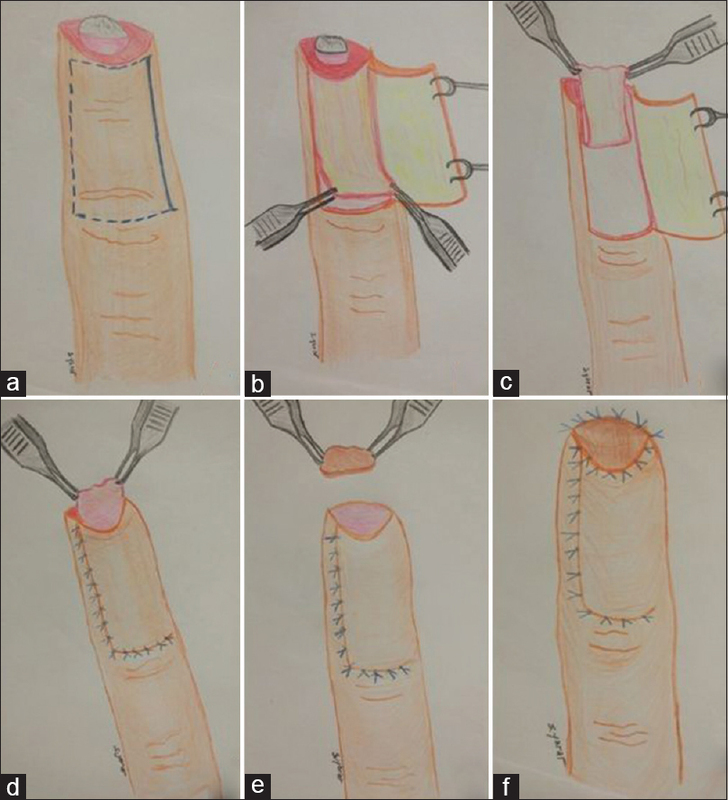 An improvement in dorsal reverse adipofascial flap for fingertip reconstruction: Nail matrix preservation. Ann Plast Surg 2005;55:155-9. Rampazzo A, Gharb BB, Bassetto F. Exteriorized pedicle technique in dorsal reverse adipofascial flap for nail complex reconstruction. Plast Reconstr Surg 2007;119:1388-90.